Augusta opened the bundle and looked at the little locket. Some images appeared in her mind: Her first croquet game. The corpse in the grey suit. The watch. The page who told her about time. A thirst to know how it worked. What is time? she wrote under the first note. Is it here? 77 Mulberry is pleased to present Augusta Prima, a solo exhibition by Cole Lu. Taking its title from Karin Tidbeck’s short story, which appears in Weird Tales, Lu has constructed decisive moments for the possibility of time travel. Intending to coagulate this speculation of the unknown, the exhibition presents an installation that delves into metaphorical and literal darkness. Comprised of a darkroom’s adumbration, the installation consists of a time machine that is activated by the act of reading, and it is made with a wired modular, a welded seat, a light box, a helmet, a pair of binoculars, and a book stand with braille embossment. The mundane dialogue composed by the erasure on the light box creates a time and/or place not present, which carries the consistent mark of Lu’s natural affection for earnestness and satire. 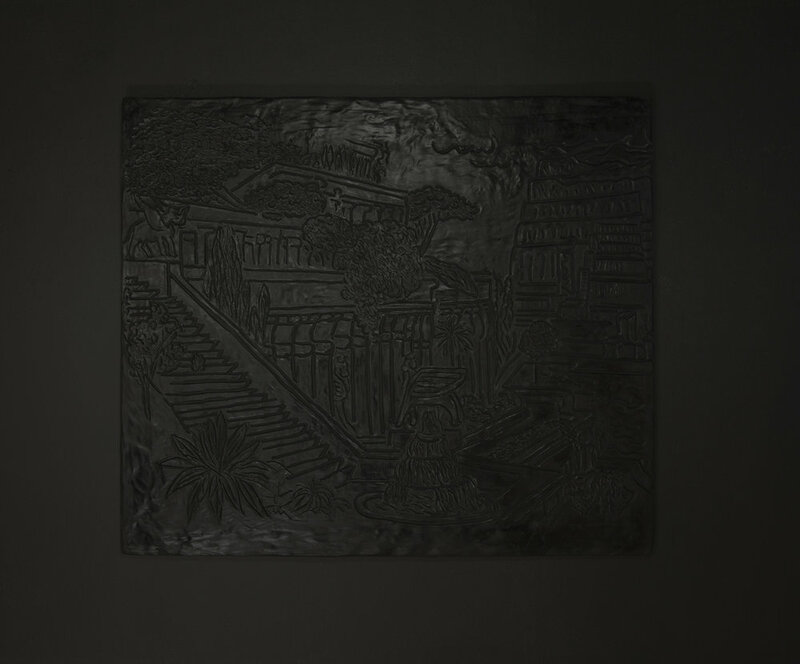 Alongside the installation is a bas-relief that renders an imaginary scene of the Hanging Gardens of Babylon, the only one of the Seven Wonders whose location has not been established, because there are no reference texts or definitive archaeological evidences of its site. Like a pair of solid objects on a fictional table, the sculptures are ceaselessly attempting to measure the distance between reality and representation. An artist book will also be launching during the exhibition, printed and published by Endless Editions, New York. The risograph publication consists of digital sketches and a poem of erasure by Cole Lu from Inferno, the first part of Dante Alighieri's Divine Comedy (1320), translated by Mary Jo Bang (2013). Cole Lu (b. Taipei) is an artist, curator, and writer based in New York. Lu's work has been included in the Contemporary Art Museum, St. Louis; Bemis Center for Contemporary Arts, Omaha; Pulitzer Arts Foundation, St. Louis; Institute of Contemporary Art, Philadelphia; American Medium, New York; Vox Populi, Philadelphia; FAIR., Miami Beach; The 3rd New Digital Art Biennale – The Wrong (Again), I Never Read, Basel; FILE, São Paulo; UICA, Grand Rapids; LACE, Los Angeles; Roman Susan, Chicago; Syndicate, Cologne; and K-Gold Temporary Gallery, Lesvos. Lu has been awarded a fellowship at Vermont Studio Center, Johnson and residencies at The Wassaic Project, Wassaic; Endless Editions, New York; and Minnesota Street Projects, San Francisco. Lu’s risograph publication, SMELLS LIKE CONTENT is in the artist book collection of the MoMA Library, New York. Lu will be the Artist-in-Residence at Triangle Arts Association, Brooklyn from December 2018—February 2019.